Sir J. Cunyngham against Capt. Chalmers. As was also, the Answer of Captain John Chalmer of Gadgirth, One of the Respondents to the Appeal of Sir James Cunyngham of Milncraig Baronet. Upon reading the Petition and Appeal of Dudley Ryder Esquire, His Majesty's Attorney General, for and on Behalf of His Majesty; complaining of an Order of the Court of Exchequer, made the 6th Day of December last, for discharging their former Order of the 27th of October, granted upon an Information filed by the Appellant against Robert Walker, requiring him to shew Cause, "Why he should not be restrained from printing and publishing any Pamphlets, News-papers, or Advertisements, without paying the Stamp Duties thereon to His Majesty;" and praying, "That the said Order of the said 6th of December may be set aside, and such Order made therein as to the House shall seem meet:"
It is Ordered, That the said Robert Walker may have a Copy of the said Appeal; and he is hereby required to put in his Answer thereunto, in Writing, on or before Tuesday the 22d Day of this Instant January. Hodie 1a vice lecta est Billa, intituled, "An Act for explaining several Powers contained in the Will of William late Lord Craven, for making Jointures and Leases; and for rendering the same Powers more effectual for the Purposes thereby intended." Hodie 2a vice lecta est Billa, intituled, "An Act for the more effectual securing and encouraging the Trade of His Majesty's British Subjects to America; and for the Encouragement of Seamen to enter into His Majesty's Service." 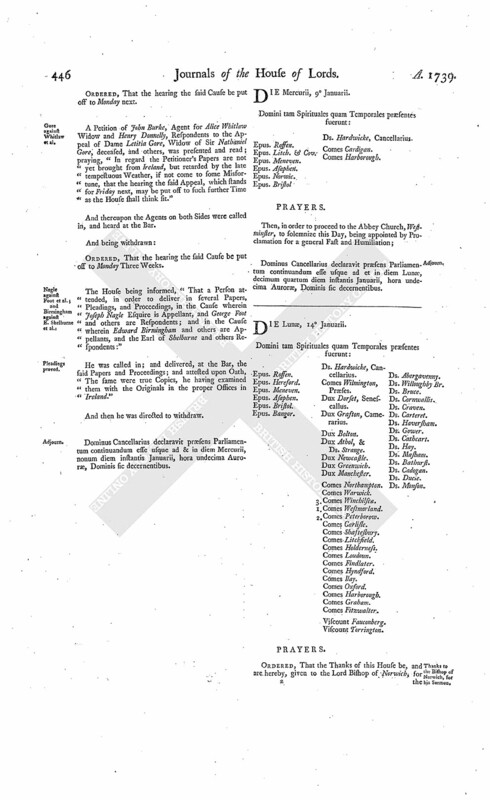 A Petition of Francis Garvan Appellant, and John Damer Respondent, was presented, and read; setting forth, "That the Petitioners having referred the Matters in Difference between them to Mr. Fazakerley, for his Opinion, he hath varied the Matters appealed from, and fixed his Opinion; but the Petitioners have not had Time to reduce the same into Writing, to lay before this House;" and praying, "That their Cause may stand over some few Days, that the Agreement may be perfected." Ordered, That the hearing the said Cause be put off to Monday next. A Petition of John Burke, Agent for Alice Whitlaw Widow and Henry Donnelly, Respondents to the Appeal of Dame Letitia Gore, Widow of Sir Nathaniel Gore, deceased, and others, was presented and read; praying, "In regard the Petitioner's Papers are not yet brought from Ireland, but retarded by the late tempestuous Weather, if not come to some Misfortune, that the hearing the said Appeal, which stands for Friday next, may be put off to such further Time as the House shall think fit." Ordered, That the hearing the said Cause be put off to Monday Three Weeks. 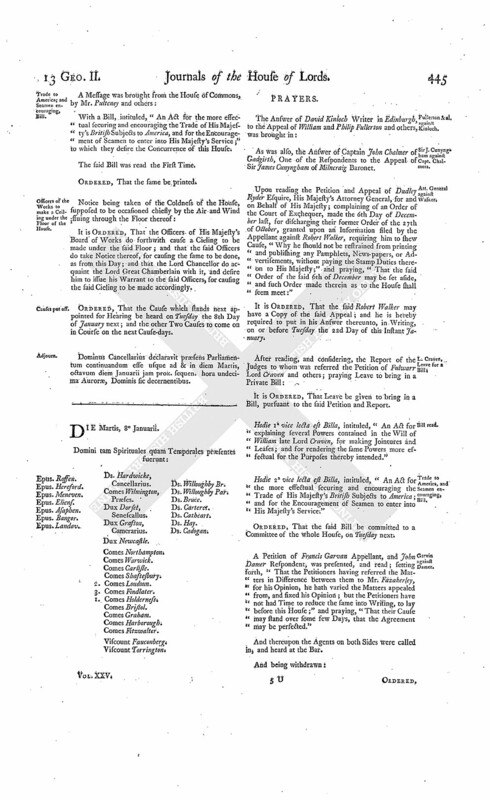 The House being informed, "That a Person attended, in order to deliver in several Papers, Pleadings, and Proceedings, in the Cause wherein Joseph Nagle Esquire is Appellant, and George Foot and others are Respondents; and in the Cause wherein Edward Birmingham and others are Appellants, and the Earl of Shelburne and others Respondents:"
Dominus Cancellarius declaravit præsens Parliamentum continuandum esse usque ad & in diem Mercurii, nonum diem instantis Januarii, hora undecima Auroræ, Dominis sic decernentibus. Dominus Cancellarius declaravit præsens Parliamentum continuandum esse usque ad et in diem Lunæ, decimum quartum diem instantis Januarii, hora undecima Auroræ, Dominis sic decernentibus.